Great Minds Robotics delivers an unparalleled classroom experience through engaging instruction and interactive SMART Boards. We've equipped both the Brainstorm Room and Robotics Lab with these fantastic pieces of technology. In both rooms, instructors and students can write on the boards with digital ink. Robots can be programmed and activated with the touch of a fingertip. Entire sessions can be recorded for later viewing. The Robotics Lab gets the added boost of SMART Board connectivity with the displays and computers used by the students. 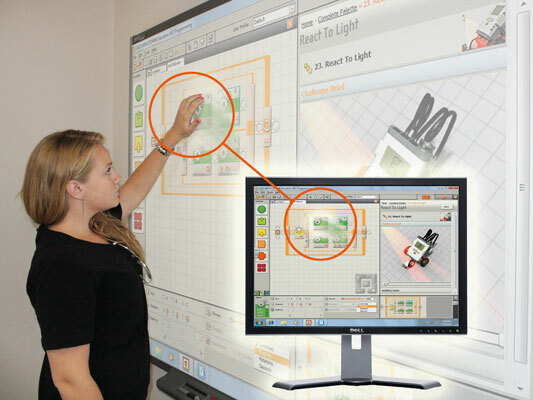 The movements, digital drawings, and instructions performed by the teacher are transmitted directly to monitors right in front of the students. Each student has their own window into a new kind of education. No looking over someone else to see. No sitting too far away from the action to tell what is happening. Watch this video to see the SMART Board being used. Open new windows for your kids today. Enroll them at Great Minds Robotics.